For other uses, see New Atlantis (disambiguation). 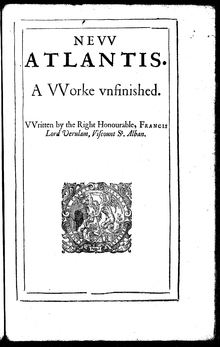 New Atlantis is an incomplete utopian novel by Sir Francis Bacon, published in 1627. In this work, Bacon portrayed a vision of the future of human discovery and knowledge, expressing his aspirations and ideals for humankind. The novel depicts the creation of a utopian land where "generosity and enlightenment, dignity and splendour, piety and public spirit" are the commonly held qualities of the inhabitants of the mythical Bensalem. The plan and organisation of his ideal college, Salomon's House (or Solomon's House), envisioned the modern research university in both applied and pure sciences. The book presents unlimited power for the rule of self appointed "scientific" experts - for example it is forbidden to even tell ordinary people that the Earth goes round the Sun. There are no legal principles of natural justice (natural law) limiting the power of this elite of "scientific" experts in Sir Francis Bacon's version of utopia. Many aspects of the society and history of the island are described, such as the Christian religion – which is reported to have been born there as a copy of the Bible and a letter from the Apostle Saint Bartholomew arrived there miraculously, a few years after the Ascension of Jesus; a cultural feast in honour of the family institution, called "the Feast of the Family"; a college of sages, the Salomon's House, "the very eye of the kingdom", to which order "God of heaven and earth had vouchsafed the grace to know the works of Creation, and the secrets of them", as well as "to discern between divine miracles, works of nature, works of art, and impostures and illusions of all sorts"; and a series of instruments, process and methods of scientific research that were employed in the island by the Salomon's House. In the last third of the book, the Head of the Salomon's House takes one of the European visitors to show him all the scientific background of Salomon's House, where experiments are conducted in Baconian method to understand and conquer nature, and to apply the collected knowledge to the betterment of society. Namely: 1) the end of their foundation; 2) the preparations they have for their works; 3) the several employments and functions whereto their fellows are assigned; 4) and the ordinances and rites which they observe. He portrayed a vision of the future of human discovery and knowledge. The plan and organisation of his ideal college, "Salomon's House", envisioned the modern research university in both applied and pure science. “We have three that draw the experiments of the former four into titles and tables, to give the better light for the drawing of observations and axioms out of them. These we call compilers. “We have three that bend themselves, looking into the experiments of their fellows, and cast about how to draw out of them things of use and practice for man's life and knowledge, as well for works as for plain demonstration of causes, means of natural divinations, and the easy and clear discovery of the virtues and parts of bodies. These we call dowry–men or benefactors. “Then after diverse meetings and consults of our whole number, to consider of the former labours and collections, we have three that take care out of them to direct new experiments, of a higher light, more penetrating into nature than the former. These we call lamps. “Lastly, we have three that raise the former discoveries by experiments into greater observations, axioms, and aphorisms. These we call interpreters of nature." Even this short excerpt demonstrates that Bacon understood that science requires analysis and not just the accumulation of observations. Bacon also foresaw that the design of experiments could be improved. "Bensalem" is composed of two Hebrew words: "ben" (בן) - "son", and "salem" or "shalem" (שלם) - "whole" or "complete". Thus the name could be interpreted as meaning "The Son of Wholeness". "There was also in both these writings, as well the book as the letter, wrought a great miracle, conform to that of the apostles, in the original gift of tongues. For there being at that time, in this land, Hebrews, Persians, and Indians, besides the natives, everyone read upon the book and letter, as if they had been written in his own language. And thus was this land saved from infidelity (as the remain of the old world was from water) by an ark, through the apostolical and miraculous evangelism of St. Bartholomew." And here he paused, and a messenger came and called him forth from us. So this was all that passed in that conference." The presence of "Hebrews, Persians, and Indians" in Bensalem at the time implies that Asian people were already in the First Century engaged in sailing across the Pacific - which is historically inaccurate, but might have seemed plausible at the time of writing. In the introduction to the critical edition of New Atlantis, Jerry Weinberger notes that Joabin is the only contemporary character (i.e., living at the time of the story) described as wise—and wise in matters of government and rule at that. Weinberger speculates that Joabin may be the actual ruler of Bensalem. On the other hand, prejudice against Jews was widespread in his time, so the possibility cannot be excluded that Bacon was calling Joabin wise for the same reason that he felt the need elsewhere to call him "the good Jew": to make clear that Joabin's character was benign. In Bacon's Theological Tracts, there are two prayers, named "The Student's Prayer" and "The Writer's Prayer" which may be a demonstration of how scientists could pray as described in The New Atlantis. (See Bacon's Prayers in Wikisource). New Atlantis and other writings of Bacon inspired the formation of the Royal Society. Jonathan Swift parodied them both in book III of Gulliver's Travels. In recent years, New Atlantis influenced B.F. Skinner's 1948 Walden Two. This novel may have been Bacon's vision for a Utopian New World in North America. In it he depicted a land where there would be freedom of religion – showing a Jew treated fairly and equally in an island of Christians. It has been argued that this work had influenced others reforms, such as greater rights for women, the abolition of slavery, elimination of debtors' prisons, separation of church and state, and freedom of political expression, although there is no hint of these reforms in The New Atlantis itself. His propositions of legal reform (which were not established in his lifetime), though, are considered to have been one of the influences behind the Napoleonic Code, and therefore could show some resemblance with or influence in the drafting of other liberal constitutions that came in the centuries after Bacon's lifetime, such as the American Constitution. Francis Bacon played a leading role in creating the English colonies, especially in Virginia, the Carolinas, and Newfoundland in northeastern Canada. His government report on "The Virginia Colony" was submitted in 1609. In 1610 Bacon and his associates received a charter from the king to form the Tresurer and the Companye of Adventurers and planter of the Cittye of London and Bristoll for the Collonye or plantacon in Newfoundland and sent John Guy to found a colony there. In 1910 Newfoundland issued a postage stamp to commemorate Bacon's role in establishing the province. The stamp describes Bacon as "the guiding spirit in colonization scheme" of 1610. Moreover, some scholars believe he was largely responsible for the drafting, in 1609 and 1612, of two charters of government for the Virginia Colony. Thomas Jefferson, the third President of the United States and author of the Declaration of Independence, wrote: "Bacon, Locke and Newton. I consider them as the three greatest men that have ever lived, without any exception, and as having laid the foundation of those superstructures which have been raised in the Physical and Moral sciences". Historian and biographer William Hepworth Dixon considered that Bacon's name could be included in the list of Founders of the United States of America. It is also believed by the Rosicrucian organisation AMORC that Bacon would have influenced a settlement of mystics in North America, stating that The New Atlantis inspired a colony of Rosicrucians led by Johannes Kelpius to journey across the Atlantic Ocean in a chartered vessel called Sarah Mariah, and move on to Pennsylvania in the late 17th century. According to their claims, these Rosicrucian communities "made valuable contributions to the newly emerging American culture in the fields of printing, philosophy, the sciences and arts". The utopian writer Kārlis Balodis adopted the name "Atlanticus" when he wrote Der Zukunftsstaat in 1898. ^ Thus foreshadowing modern response surface methodology and optimal design. ^ J. Weinberger, "Science and Rule in Bacon's Utopia: An Introduction to the Reading of the New Atlantis," The American Political Science Review, Vol. 70, No. 3 (Sep. 1976), pp. 865–885 (875). ^ a b David Renaker, "Miracle of Engineering: The Conversion of Bensalem in Francis Bacon's New Atlantis", Studies in Philology, Vol. 87, No. 2 (Spring, 1990), pp. 181–193 (193). ^ Francis Bacon, New Atlantis and The Great Instauration, Jerry Weinberger, ed., (Wheeling, IL: Crofts Classics, 1989), xxv–xxvi, xxxi. ^ "The Letters of Thomas Jefferson: 1743–1826 Bacon, Locke, and Newton". Retrieved 13 June 2009. Bacon, Locke and Newton, whose pictures I will trouble you to have copied for me: and as I consider them as the three greatest men that have ever lived, without any exception, and as having laid the foundation of those superstructures which have been raised in the Physical & Moral sciences. ^ Hepworth Dixon, William. Personal History of Lord Bacon from Unpublished Papers. p. 200.